Biotin-labeled Pro5® MHC class I Pentamers allow the enumeration and isolation of antigen-specific CD8+ T lymphocytes. Multimeric MHC-peptide complexes bind to T cell receptors (TCRs) of a particular specificity, as determined by the MHC allele and peptide combination. CD8+ T cells stained with biotin-labeled Pro5® Pentamers, followed by staining with fluorescent streptavidin conjugates, can be analyzed by flow cytometry in order to determine the frequency of antigen-specific T cells. Biotin-labeled Pentamers can also be used to isolate or deplete antigen-specific CD8+ T cells through the use of streptavidin-coated magnetic microbeads. Isolation of antigen-specific T cells in this manner is useful if viable cells need to be obtained for further analysis such as T cell culture or gene expression profiling. Biotin-labeled Pentamers can also be used in plate based assays such as ELISA, where they can be immobilized to streptavidin coated surfaces. Pro5® Biotag is a biotin tagged protein that binds specifically to unlabeled Pro5® Pentamers, and is for use in flow cytometric analysis as a secondary reagent. CD8+ T cells stained with Pentamer plus Pro5 Biotag in combination with a fluorescently labeled streptavidin conjugate of choice can be analyzed by flow cytometry and the frequency of antigen-specific T cells determined. Use of Biotag with unlabeled Pentamers therefore provides increased experimental flexibility and enhanced application capability of Pentamer staining. CD8+ T cells stained with a biotin-labeled Pentamer in combination with a fluorescently labeled streptavidin conjugate of choice can be analyzed by flow cytometry in order to determine the frequency of antigen-specific T cells. A wide range of streptavidin-conjugated fluorochromes is available for use with biotin-labeled Pentamers, enabling increased flexibility in staining experiments with multi-channel flow cytometers. The figure below shows example staining in which 1 x 106 peripheral blood cells were stained using a B*08:01/RAKFKQLL (EBV BZLF-1)-specific biotin-labeled Pentamer followed by either SA-PE, SA-PerCP, or SA-PE Cy5. Even though fluorescence intensity is not the same with each fluorescent label, a similar degree of antigen-specific staining is achieved. Isolation or depletion of antigen-specific CD8+ T cells is easy using biotin-labeled Pentamers in conjunction with streptavidin coated paramagnetic beads. ProImmune’s biotin-labeled Pentamers are suitable for use with any bead system and bead supplier, which means that they may be used with existing reagents and equipment. Isolating antigen-specific T cells in this manner is useful if viable cells need to be obtained for further culture or analysis, such as expression profiling. The figure below demonstrates the depletion of antigen-specific cells from a peripheral blood suspension using a B*08:01/RAKFKQLL (EBV BZLF-1)-specific biotin-labeled Pentamer. 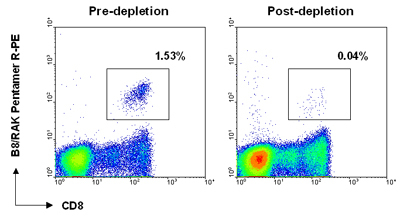 A sample of the original cell population (pre-depletion) and supernatant following isolation (post-depletion) were incubated with anti-CD8-FITC antibody plus SA-PE to visualize antigen-specific cells. The antigen-specific population was reduced from 1.53% to 0.04%, confirming that bead isolation of EBV BZLF-1 cells was successful. Artificial antigen presentation has become an important tool for stimulating and expanding cells in culture. Biotin-labeled Pentamers can be coupled to >2μm streptavidin labeled paramagnetic beads and used in conjunction with co-stimulatory antibodies, such as biotinylated anti-CD28 and anti-CD40 antibodies, to stimulate single antigen-specific T cells in vitro. Biotin-labeled Pentamers may be immobilized on any streptavidin-coated surface for use in in vitro assays such as plate based ELISA. Pentamers are particularly suitable for this experimental platform as the extended directional structure of the molecule means that a high copy number of MHC molecules are presented/made available. In the figure below, a 96-well ELISA plate was coated with serial dilutions of an A*02:01-specific biotin-labeled Pentamer. Bound Pentamer was visualized by addition of an anti-A*02:01 conformational antibody, followed by anti-mouse Ig-HRP and TMB (3,3′,5,5′ – Tetramethylbenzidine). Plates were read at 450 nm and the plot shows Pentamer concentration against absorbance. Wash buffer (0.1% sodium azide, 0.1% BSA in PBS), Fix solution (1% fetal calf serum, 2.5% formaldehyde in PBS), Biotin-labeled Pro5® Pentamer specific for the antigen of choice, Fluorescent-labeled streptavidin conjugate, Anti-CD8 antibody (of a different fluorescence to the streptavidin conjugate). Allocate 1-2 x 106 lymphoid cells (PBMC or splenocytes) per staining condition. (Allocate only 2-5 x 105 cells per staining condition when using T cell clones or lines due to the high frequency of antigen-specific T cells). Wash the cells with wash buffer and resuspend them in the residual volume (~ 50 μl). 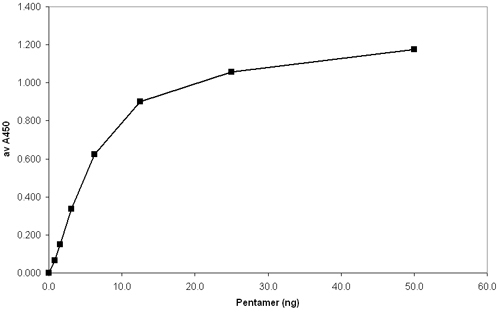 Add one test (10 μl) of biotin-labeled Pentamer per staining condition. Incubate at room temperature for 10 – 15 minutes. Wash the cells with a 10x volume of wash buffer. Add optimally titrated amounts of fluorescent-labeled streptavidin and anti-CD8 antibody per staining condition. Incubate on ice for 20 – 30 minutes in the dark. Wash the cells twice in wash buffer and store them in fix solution in the dark. The cells are now ready for flow cytometric analysis. The Pentamer-positive cells are most conveniently viewed by gating first on live lymphoid cells and then analyzing on a two-color plot showing CD8 on the x-axis and Pentamer on the y-axis. Wash buffer (0.1% sodium azide, 0.1% BSA in PBS), Fix solution (1% fetal calf serum, 2.5% formaldehyde in PBS), Unlabeled Pro5® Pentamer specific for the antigen of choice, Pro5® Biotag, fluorescent-labeled streptavidin conjugate, anti-CD8 antibody (of a different fluorescence to the streptavidin conjugate). Add one test (2 μl) of unlabeled Pentamer per staining condition. Add one test (8 μl) of Pro5® Biotag. Incubate on ice for 20 – 30 minutes. Wash buffer (0.1% sodium azide, 0.1% BSA in PBS), Streptavidin beads (e.g. Lodestars 2.7 Streptavidin from Polymer Labs; Dynabeads M-280 Streptavidin from Dynal Biotech). For best results start with at least 1 x 107 lymphoid cells (PBMC or splenocytes). Wash cells with wash buffer and resuspend in 200ml wash buffer. Add 1 test (10 μl) biotin-labeled Pentamer per 2 x 106 cells. Wash the cells in wash buffer and resuspend in 500 μl wash buffer. Add an optimally titrated amount of streptavidin beads (at least 5 beads/cell is recommended). Incubate on ice for 30 minutes with mixing. Bring the volume in the tube up to 2 ml with wash buffer then place in a magnetic particle separator. Leave for 3-5 minutes. If desired, supernatant can be retained for flow cytometric analysis to confirm removal of antigen-specific cells. Wash the fraction containing bead-cell complexes 3 times with wash buffer and discard supernatant. Isolated bead-cell complexes may be placed in cell culture, where beads should dissociate after a few days. Phosphate-buffered saline (PBS), Streptavidin, 0.1M Sodium Bicarbonate (NaHCO3), Tween-20, Bovine Serum Albumin (BSA). Coat a solid surface (e.g. ELISA plate) with 100 ng / well streptavidin (100 μl / well of 96-well ELISA plate) by incubating overnight in 0.1 M NaHCO3, pH 8.2 at 4ºC. Wash the surface 3 times with PBS / 0.05 % Tween-20. Block with 5 % BSA / PBS (200 μl / well of 96-well ELISA plate) and incubate for 1 hour at room temperature. Add 50ng / well biotin-labeled Pentamer (or a titration if desired) and incubate for 1hr at room temperature. Wash the surface 3 times with PBS / 0.05 % Tween-20 and proceed to your desired assay.